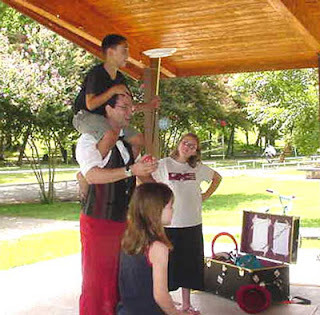 Here are a couple of pictures from a show I did for the Bastrop library in 2004. Cedar Park Libary, 2pm and 3:15. Free to the public. 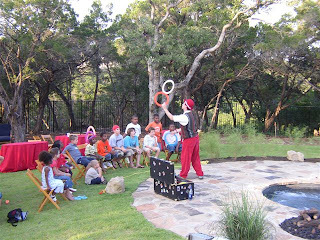 I heard on the Texas Juggling Society mailing list that Connie Leaverton will be among those performing Saturday, June 23 in a kids' show at Ruta Maya Coffee House here in Austin (3601 South Congress Avenue). The show runs from 2 to 4 PM and it's a four-act variety show. Connie's show is always lots of fun. I'm not sure what Connie's going to be doing at THIS show....recently I've seen her do some fun things with a cowboy-themed unicycle act, where her unicycle is treated as a recalcitrant horse. 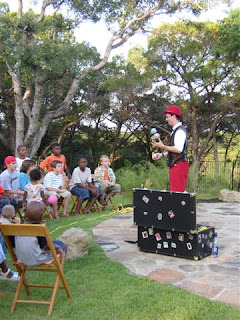 Here are a couple of photos from a backyard party I performed at in 2004. Well, I call it a backyard party. It was kind of a mansion. The area where I juggled was the lower terrace of an enormous back yard. To get on my calendar for a show, send an e-mail to aaron AT damommio DOT com. and I can then tell you how much it'll cost. 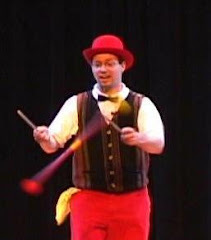 Includes an assortment of juggling tricks involving reluctant clubs, dancing balls, flashy boxes, and flying sticks. For a detailed description, click here. For outdoor shows, please have a backup indoor area available in case of rain or strong winds. I have a renaissance-style costume ready so that I can provide your Madrigal Dinner, Renaissance feast, party, or festival with period-style juggling. More than ten years of experience performing in the University of Texas Madrigal Dinner. I've produced 'em, written 'em, and performed in 'em. A 30-minute show tailored for 2nd grade science curriculums using the Balance and Motion Foss kit. Requires a 10' wide semicircle performance area with a hard floor or berber carpet. 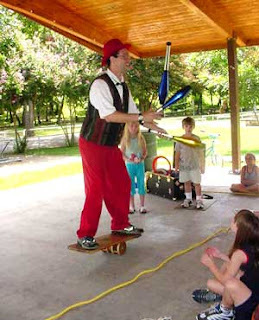 I'll be doing a show at 9:30 a.m. at the Pioneer Library in Fredericksburg next week, on 6/13/07.